This program offers youth the opportunity to expand their awareness and build their self-confidence through ever-increasing literacy. We’re confident the donated books and other materials will encourage youth to broaden their environment, venturing beyond the one in which they’ve grown up. We’re also hopeful the books will remind the youth that they’re loved and inspire them to reach for the stars! PHOTO: The Operation For HOPE Foundation teamed up with the San Diego SHOW a traveling baseball team that’s not only committed to excellence on the field but with but to assisting youth who are less fortunate. During the summer of 2009 this team collected hundreds of books to give to Camp HOPE. Books were labeled with the key message, “Read Every Day.” They were also separated according to appropriateness for age groups. A special thank-you to the Ramirez family! Every year, go through the books you have at home and select those you can donate. We all have books and materials that we no longer need. Why not put them good use? Book donations encourage and improve literacy for youth of all ages. Our special focus is youth impacted by family violence. We accept “gently used” children’s and youth books, DVDs and other materials. 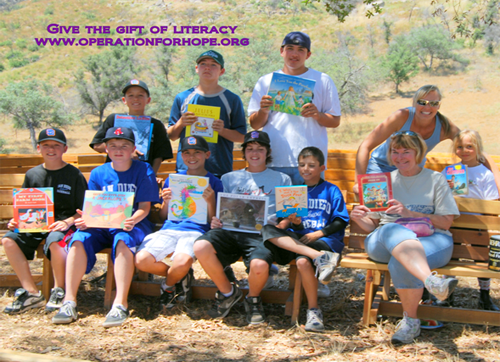 We appreciate your interest in the Give the Gift of HOPE Literacy Program. The Operation for HOPE Foundation is seeking funding for this program as well as donated books and other materials. Your help is needed and will be deeply appreciated!